San Diego Union Tribune writer Tod Leonard breaks down The Crossings-At-Carlsbad with all the trials and tribulations of its 18 year trudge into reality. After reading this story it’s a wonder the place is going to open at all. From dinosaurs and indian burial grounds, to plane crashes and talking golf carts, Carlsbad’s muni golf course is a compelling $64 million story. Olmos was pulled over about 10 a.m. Monday at Carlsbad Village Drive and Rising Glen Way in a black-and-white Ford Crown Victoria equipped with emergency lights, Lt. Neil Gallucci said. . . Officers found a gun belt and a bullet-resistant vest in the car, and arrested Olmos, Gallucci said. Apparently, 38 is a little too old to be playing cops and robbers in Carlsbad. . . thankfully. A 17-year-old Carlsbad boy appears to have purposefully driven his car into a light post on the corner of El Camino Real and Poinsettia Lane late Sunday night July 29, 2007 hoping to kill himself. The young male behind the wheel apparently drove into the light pole at high speed, police Lt. Don Rawson reported. The boy was the only occupant in the vehicle. . . “Subsequent investigation showed the crash to be intentional and the collision a completed suicide,” Rawson wrote in a statement. Carlsbad was well represented at the 2007 US Open of Surfing in Hunting Beach, California this week. While former US Open women’s champion Julia Christian lost out in the round of 24, Cherry Street charger Kyla Langen made it to the round of 12 before getting knocked out of the event. Luckily for Carlsbadistan we still have US Longboard Champion Taylor Jensen. He is set to compete in the longboard finals today at 1:45 PM. Check him on on the live video feed by clicking here. Carlsbad’s hometome trading card and sport memorabilia company Upper Deck has decided to pull Atlanta Falcons quarterback Michael Vick from its 2007 trading card releases and removed Vick memorabilia from their online store after allegations of Vick’s involvement with dog fighting have been brought to light. Guess this rules out the official Michael Vick maimed dog action figures, huh? Carlsbad Biologist Jim Rockoff’s sculpture “Lepidoptree” is one of 30 Urban Trees adorning San Diego’s Embarcadero as part of an commissioned art project by the Port of San Diego. Rockoff’s design was inspired by witnessing a gulf fritillary butterfly laying its eggs on a vine last fall. His tree, the closest to nature’s version, depicts each of the insect’s life stages, from chrysalis to butterfly. Before maturing with striking orange wings, the thorny caterpillars dine on passion fruit vines. The 12-foot-tall “tree” is made of aluminum, hand-carved balsa wood, fiberglass, and latex paint according to the San Diego Union Tribune. Lepidoptree will be on display near the Star of India through June of 2008, so there is still time to go check it out. Carlsbad’s summer TGIF Jazz In The Parks moves to the heart of Carlsbadistan for two weeks. The Pine Avenue Park leg of the tour kicks off with Ricardo Lemvo & Makina Loca. 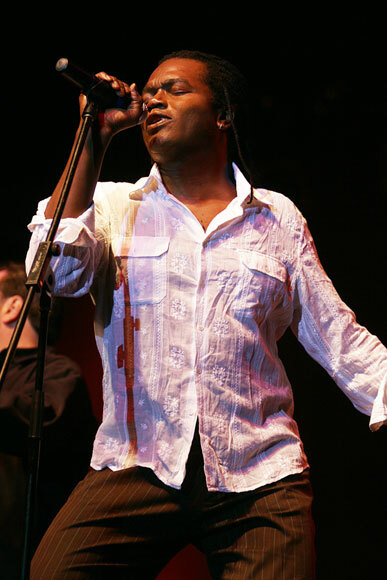 Ricardo Lemvo has established himself as a pioneer with his innovative music, combining Latin and African elements from salsa to soukous with an occasional merengue or Afro-Portuguese excursion. This Congo-born artist of Angolan ancestry is the embodiment of the Afro-Latin Diaspora which connects back to Mother Africa via the Cuban clave rhythm. Lemvo is truly multi-cultural and equally at home singing in English, French, Spanish, Portuguese, Lingala, and Kikongo. We’re going to walk to this one (dragging an ice-chest), see you there. 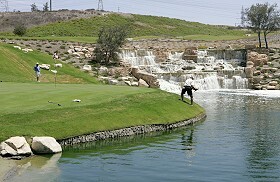 While the course itself won’t open for play until August 11, the city’s $63.3 million project The Crossings-At-Carlsbad will be open for public inspection today. During today’s events, people will be able to look out the windows of what Kulchin describes as “one of the most beautiful clubhouses I’ve ever seen.” They’ll also be able to practice their putting skills and even hike the trails that run through the project. We don’t know which is worse: seeing the course and not being able to play it, or just skipping the event entirely. We think we’re going to wait. San Diego’s NBC 7/39 recently ran a story on areas of San Diego where a person is most likely to experience an aggravated assault. Well, lucky us. According to their reports Carlsbadistan has had nine more assaults this year compared to last. They didn’t give the total, but at least we’re not leading the county. Two masked Latino men who robbed Yanagi Restaurant on El Camino Real and Alga and then hit the Marriot Residence Inn on the 2000 block of Faraday Tuesday night July 24 are being sought by police. The suspects are described as approximately 25 year olds, 5-foot-11 to 6-feet tall, and weighing 160 to 170 pounds. They reportedly escaped in a “gray or silver” SUV and made it to Vista where they robbed a Mexican restaurant. At least it wasn’t another Carlsbad bank, huh?